Family portrait sessions are so meaningful. We really enjoy doing these and capturing memories that will last these families a lifetime, even after someone may pass away. This family had their session at Fort Niagara State Park. This is one of our favorite locations for these shoots. There is an old victorian style house in the park. Kind of a hidden gem! When people want vintage photos, it always works out great heret. That is the style this family wanted. We started with group shots all around the house. Having stairs for photos works great for large group shots. We had the grandparents right in the middle and all of the children, grandchildren, moms and dads surrounding. We love the broken cement steps and chipped paint. After this we walked around different areas of the park and did smaller group family shots. The families always appreciate when we do this. We want them to be able to hang beautiful images of their families on the walls. We ended the session down by the water on Lake Ontario. Still at Fort Niagara. We wanted to try and get some sunset photos for a different look. These turned out so good too! We try to give as much variety as possible. Family portraits are always good to do on locations. 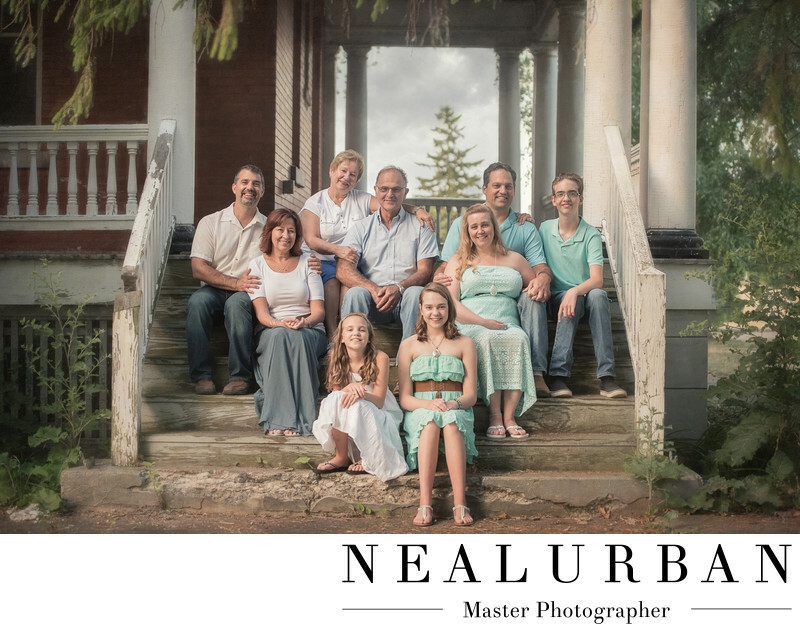 They contact Neal Urban Studio and we find out what style of photos they are looking for. If they have no idea, we throw out a bunch of ideas. Once that is decided, we can suggest locations! Location: 1 Scott Ave Youngstown, NY United States.